The rugged coast and charming shops in this picturesque town are perfect for a day trip or weekend away. A stroll along Marginal Way in Ogunquit, Maine, ranks among the most picturesque walks in New England, if not the country. Off to the inland side of the paved path, gracious homes with rolling lawns sit looking out to sea, as many of them have for more than a century. At the other side, Maine’s dramatic rocky coast. The path, scented with beach plums, rises and falls gently, twisting and curving as it hugs the oceanfront between downtown and Perkins Cove, a storybook enclave of seaside-shanties-turned-art-galleries and popular restaurants. At just over a mile, much of which is lined with benches, it is a leisurely path inviting contemplation, and it is fully accessible. In fact, those with difficulty getting around can stop by the Ogunquit fire station to borrow a wheelchair for the trip. Thoughtful touches like that, as well as a welcoming, inclusive vibe, have been attracting couples and families to this classic village for generations. Downtown boasts everything from candy shops like Harbor Sweets, selling its delicious handmade chocolates for more than 50 years, to The Front Porch, a piano bar that has been entertaining tourists and locals of all ages for more than a quarter century. For even deeper roots, head to the Ogunquit Playhouse, a premiere destination for musical theatre for some 85 years, where the current season presents a mix of classics like Ragtime and new productions like Heartbreak Hotel, from the creator of the Tony Award-winning musical Million Dollar Quartet. Nowhere is that mix of seaside charm and modern sensibility more on display than at Cliff House Maine. The resort has perched on a spectacular site for nearly 150 years, and reopened last fall to much fanfare after an extensive renovation. Step through the front doors, and the whole magnificence of the Atlantic Ocean is spread out before you through a two-story wall-to-wall window. Every room has an oceanfront balcony, giving early birds the opportunity to watch the sunrise wrapped against ocean breezes in one of the hotel’s snuggly bathrobes. Cliff House easily lives up to its name—a pair of water-view restaurants feels suspended over the water and one of the property’s two pools is perched on the cliff’s edge, with the other indoors for year-round enjoyment. Cliff House, overlooking a jagged rocky coastline, doesn’t have a sand beach, but Ogunquit’s broad strand is about 10 minutes away. Catch the seasonal trolley that laces through town with a stop at Cliff House to avoid parking headaches. Stretching for 3.5 miles, Ogunquit’s wide, flat beach is definitely the main attraction. With a gentle surf and plenty of amenities, it’s easy to while away a day—or a few days. If the main beach is crowded, check out charming Footbridge Beach, a bit to the north, for soft sand and more solitude. In June and July, watch for piping plovers—especially in the natural section of the beach. These tiny endangered puffballs fledge in the nearby sand dunes and even on the beach, making for adorable bird-watching for the careful observer. Learn more about these feathered friends and many others at Rachel Carson National Wildlife Refuge—this thoughtfully managed retreat a bit further north in Wells even has plover tattoos for the young and the young at heart. Stop in at mid- to high tide to see a variety of wading birds, like herons and egrets, searching for food. Additionally, mid-summer is a great time to see migratory birds making their way from summer in the Arctic to winter in South America. Stop in to chat with the friendly staff, and borrow a backpack with a birding guide and a pair of binoculars. For those seeking further hiking adventures, the staff also offers a guide to other trails in the area. After a day exploring the shore, head back to Ogunquit for cocktail hour. At Barnacle Billy’s, overlooking Perkins Cove, the Special Rum Punch is legendary—consume with caution. The restaurant also offers a full selection of seaside shanty favorites, from fresh lobster to steamers and fried clams. For a quieter evening and an Italian-inspired menu, check out No. Five-0 Shore Road, or reserve well ahead to enjoy the locally inspired cuisine at M.C. Perkins Cove. Among other accolades, the spot was chosen by USA Today as one of the “top 10 places in the world with a view,” with windows on three sides that invite the ocean in. It may be easier to score a table for lunch or brunch—the Bloody Mary is a meal in itself. 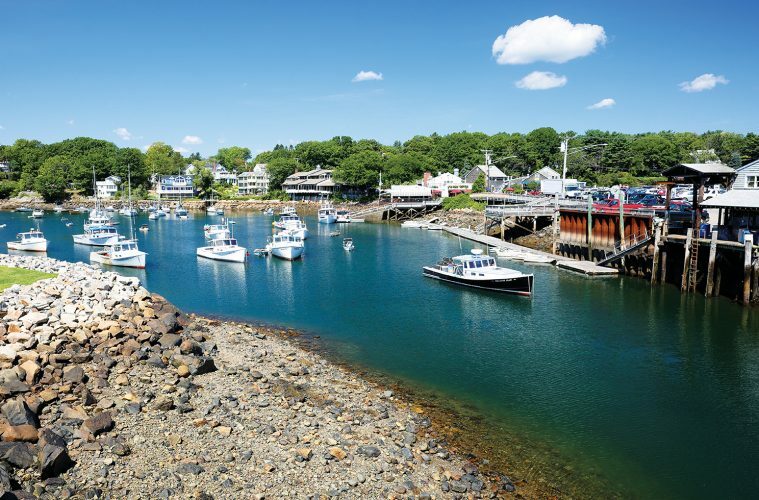 While the great food and natural beauty certainly draws visitors in, Ogunquit is also a cultural destination. Artists have been drawn to the landscape for more than a century, and the Ogunquit Museum of American Art (OMAA) has celebrated that connection since 1953. With its roots in two of America’s earliest art colonies, the OMAA houses a permanent collection of paintings, sculpture, drawings, prints, and photographs from the late 1800s to the present. With a new director who specializes in film and new media joining the staff this spring, expect this lovely small museum to embrace a new chapter, while continuing to celebrate local artists and its three acres of sculpture gardens overlooking the Atlantic Ocean. That view is just as inspiring today as it has been for centuries—the name Ogunquit means “beautiful place by the sea” in the native Abenaki tribal language. Pack a sketch pad, pull up a bench, and give in to the muse of the sea.